Does Rosanne Parry Throw Responsibility on Tribal Nations to Object to Her Book? In 2014, I had a very long public exchange with Rosanne Parry after I posted my review of her book, Written In Stone. When I reviewed Lane Smith's A Tribe Of Kids in 2016, Parry defended that book. That 2014 exchange was--and is--one of the more frustrating experiences I've had. I stuck with it, though, because I believed it was useful to writers who were creating Native content. First I'll tell you about a mistake I made through ignorance. In my activities book Math Comes Alive (1987) I had a lesson on symmetry in the masks of several cultures. To show lack of symmetry, I included an asymmetrical "false face" mask of the Haudenosaunee (Iroquois), copied from the Dover publication American Indian Design and Decoration, by LeRoy Appleton. At the time I did not realize that this mask was considered sacred. Some time later I had occasion to correspond with the Board of Education at the Akwesasne Mohawk School District in northern New York and southern Ontario. (The Mohawks are one of the six nations of the Iroquois Confederacy.) To ascertain that this use of the mask was not offensive, I sent a copy of the lesson to the Board's office. The reply confirmed my worst fears. Fortunately my book was due to undergo a major revision, and this lesson on masks was withdrawn from the new edition, Multicultural Mathematics: Interdisciplinary Cooperative-Learning Activities (1993a). So, Beverly, I don't know if you corresponded with Zaslavsky or not, but if you did, it seems you mixed up a couple books and/or authors. At least she listened and revised her book. Let's hope Parry eventually does the same. I think her main problem is that she doesn't know any Kwakiutl, Makah, or Quinault who are as vociferous in their objections to the book as she has been in her defense of it (you know, of the kind some whiny white authors love to call "angry vitriolic call-out culture"). Thanks for chiming in Sam. Just to be clear I'm not calling anyone here angry or vitriolic. Debbie has makes a strong case and argues it vigorously. Though I disagree with her on some of the particulars I don't have any wish to silence or disrespect her. The Quinault and Makah are well aware of this book and this conversation. They are media savvy and have historians and cultural experts of their own. I listened to them in the making of the book and made amendments where they had concerns. I am still listening, should objections arise over time. To date, nobody from either tribe has weighed in with a public request for a change to the text or communicated with me privately. Should they do so I'd be glad to revisit those passages. Random House has been supportive of the concerns of the Quinault and Makah from the start and will gladly amend the text when it comes up for reprint. One of the things that Debbie has consistently advocated for is the recognition that American Indians are not a monolith and that each tribe must speak for themselves on matters of their own culture. So Debbie has given me much to think about and much that I consider in future writing; however, the final say for Written in Stone belongs not with her but with the Quinault and Makah themselves. There's a lot to respond to there! As written, she suggests that the Quinault and Makah know about her book, my critique, and they're saying nothing. Which means... her book is fine? I have, as Parry notes, consistently advocated for recognition that we are not a monolith. I have also suggested that writers who are creating Native content do research before writing their book, and that they ought to visit a tribal nation's website as a starting place for that research. Some nations have protocols on their sites, with instructions for writers. I've having trouble understanding Parry's next words: "each tribe must speak for themselves on matters of their own culture" and that until the Makah or the Quinault nation say 'no' to her book, then we can assume that what she has written in Written In Stone is fine. My criticism of the book, according to her, is therefore, irrelevant. It seems to me that Parry thinks that criticism from anyone not of a particular nation can be ignored. Do you read that line that way, too? I imagine that, in some places, people--Parry, perhaps--are creating a parallel between #OwnVoices in the writing of children's and young adult books, and #OwnVoices as critics of those books. That, perhaps, there's a mentality out there that goes something like this: "Those people and their #OwnVoices movement. We'll show them. If they're gonna insist on THAT, we can insist on #OwnVoices critics, too." This all reminds me of efforts to validate mascots like "chief illiniwek." Fans of that stereotypical mascot tried for years and years to say it honors the Indigenous people who used to live in what is currently called Illinois. More than once they decided they'd visit the Peoria Nation for their endorsement. Other Native people, they argued, had no say in the matter. More than once, however, the Peoria Nation told the 'chief illiniwek' fans that the mascot is stereotypical and they do not endorse it. Most recently, two members of the university's Board of Trustees went down there for an endorsement and again, were told no. Because she does not offer it, I assume that Parry has not gone to either nation's tribal council or the office with authority to speak about her book to get their endorsement. So she asks people to assume that her book is fine. Until they say no to it, then, does she want us to ignore criticism of it? Isn't that... morally bankrupt? In my reply to Rosanne's comment yesterday, I asked if the Makah or Quinault museum stores carry her book. I also got in touch with Janine Ledford, Executive Director of the Makah Cultural and Research Center, where Parry went to do some of her research for the book. Ms. Ledford wrote back to say that they do not sell her book. Will Parry dismiss it because it is a private communication to me? Given all that she's said to me in the past, I think that is entirely possible. Her audacity is astonishing. And exhausting. That's all I have, for now. On to other tasks. This is a quick post to recommend Art Coulson's Unstoppable: How Jim Thorpe and the Carlisle Indian School Football Team Defeated Army. 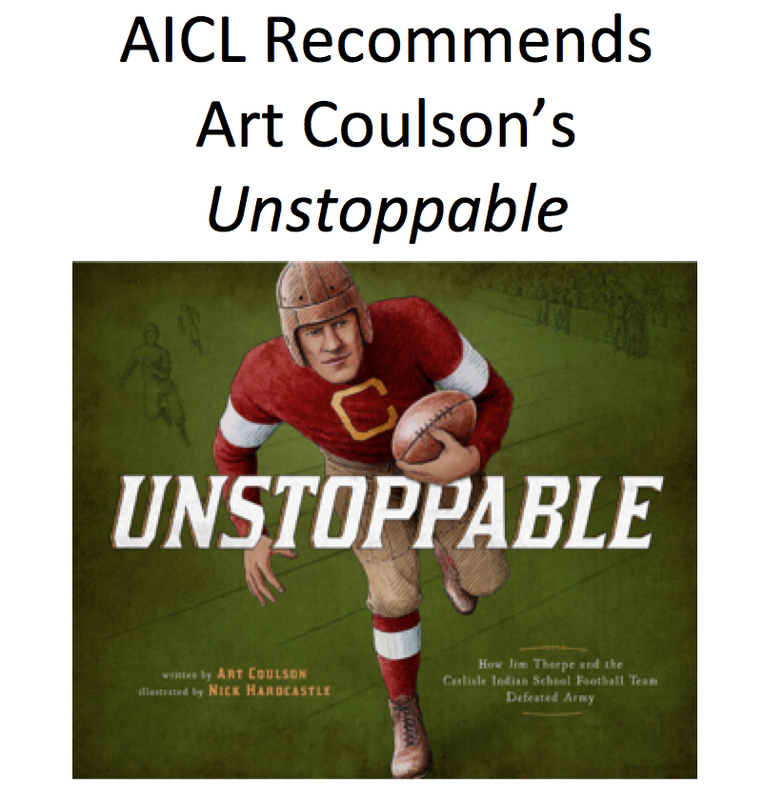 Published by Capstone, it is one that I think teachers can use in the classroom, and that every public and school library ought to have on the shelves. Do you use Le Roy H. Appleton's American Indian Design & Decoration? Update, 7:50 PM, September 25, 2018: Earlier today, Rosanne Parry submitted a comment to my review of her book, saying that the Makah and the Quinault nations have final say on the merits of her book. I contacted Janine Ledford, the Executive Director of the Makah Cultural and Research Center to ask if they sell Parry's book in the museum store. Ms. Ledford replied that they do not sell Parry's book in the museum. Multiple perspectives on customs, practices, and worldviewFirst I'll tell you about a mistake I made through ignorance. In my activities book Math Comes Alive (1987) I had a lesson on symmetry in the masks of several cultures. To show lack of symmetry, I included an asymmetrical "false face" mask of the Haudenosaunee (Iroquois), copied from the Dover publication American Indian Design and Decoration, by LeRoy Appleton. At the time I did not realize that this mask was considered sacred. Some time later I had occasion to correspond with the Board of Education at the Akwesasne Mohawk School District in northern New York and southern Ontario. (The Mohawks are one of the six nations of the Iroquois Confederacy.) To ascertain that this use of the mask was not offensive, I sent a copy of the lesson to the Board's office. The reply confirmed my worst fears. Fortunately my book was due to undergo a major revision, and this lesson on masks was withdrawn from the new edition, Multicultural Mathematics: Interdisciplinary Cooperative-Learning Activities (1993a). When I read the comment, I thought it would be helpful to share it as a stand-alone blog post because it reflects a writer's growth in understanding and respecting Indigenous peoples, and it also references her source for the mask she subsequently removed from her book. That source is LeRoy Appleton's American Indian Design and Decoration. Appleton's book came out in 1950. A new edition was published in 1971. In 2013 it was published in ebook format. I have not reviewed that book, but its initial publication date is 1950. The contents of the book reflect a way of thinking by a particular person, in 1950. I wonder if it has been revised? Do you have it in your library? Do the teachers in your school use it? I haven't read or reviewed Zaslavsky's book either. Is it in your school? 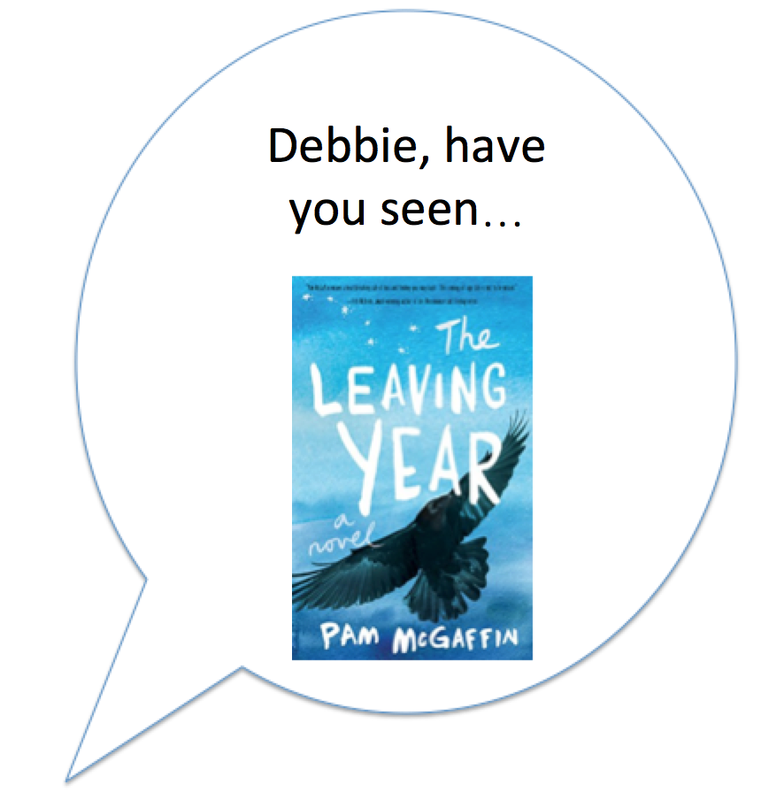 Debbie--have you seen THE LEAVING YEAR by Pam McGaffin? The "Native Alaskan" girl is, according to the review in Kirkus, Tlingit. That review also notes that Ida's father has an affinity for "the "scoundrel" raven of Alaskan myth." 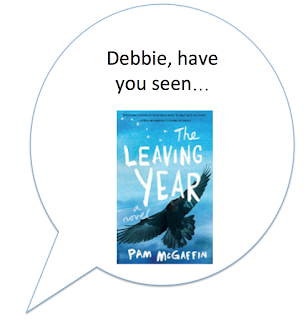 The review in School Library Journey says that McGaffin wove Indigenous legends into Ida's journey. Using the Google books preview, I see that in chapter two, McGaffin is remembering time with her dad. That he "loves the Native Alaskan myths, with their wild explanations of how things in nature came to be." Wild explanations of Indigenous myths? Hmm. I'll take a wild guess and say that I bet Ida is going to come to an appreciation of Alaska's Indigenous people that she doesn't have when the book starts out. Raven was a sly, crafty fellow who used trickery to get what he wanted, and he wanted that box of stars." "Um, I don't remember everything, but he basically talked about the bad things the white men did to the Natives in Alaska, like bringing disease and taking their kids away to live in boarding schools." David's Adam's apple goes up and down as he swallows. "I guess it was really horrible for those kids. First, their parents die of TB or whatever--"
"TB, like tuberculosis?" I flash back on the women in Poe's life. "Yeah, then they're stuck in these schools that force them to become Christians. Imagine being taken away from every you know... forever." "Did Dad turn that guy around?" "Who knows? I've never forgotten it, I can tell you that. I think the reason he got so mad was because he had friends up there. Natives. There was this one Aleut lady he talked about alot. She ... uh, worked on Creek Street." He pauses, like that's significant. "Do you know about Creek Street?" "Well, its pretty famous for... a certain activity. The joke is that it's the only place where both salmon and men come to spawn." It takes me a while, but when I finally get it, heat creeps up my cheeks. David's too wrapped up in his story to notice. "Anyway, this lady had a nickname that her own people used against her. It was really rude, but she started using it herself to show she wasn't..."
David tells her the name was "Two-Bit" but that she was retired from that work (the word is in italics in the book) by the time Ida's dad got to know her. David says he'll tell her more, tomorrow, but he doesn't show up. The Kirkus review says that Ida decides to go to Ketchikan after contacting a woman her father knew there. "Yakíei yee yt  xwal geini. That means, 'It is wonderful to look upon your faces.' You must be Ida." She turns to my mom. "And you the mother." "rather the totems chose them. They went on spirit walks and thought about those who came before." I am wondering at this point if Ida is going to have a clan or totem by the end of The Leaving Year. Back in the office, Trinity shows Ida and her mom photographs. Ida's dad is is many of them. He helped raise that totem pole. Ida thinks that her dad wasn't doing something shameful (having an affair). He was doing something more "saintly." As they look at more photos, Ida interrupts to ask who "Miss Red" is. Seems Ida has a note that refers to her dad and Miss Red, and she thinks Miss Red is someone her dad was carrying on with. Trinity tells her that Miss Red is what they call his boat. He calls it "Lady Rose" but they call it "Miss Red." "Okay, so Miss Red was the boat," she says. "But how do you explain the condoms? I'd find condoms in Steve's pockets." Trinity tells them that she provides condoms to the teens in the center. People donate items to help run the center but she dare not ask anyone for condoms. Turns out, Ida's dad was Trinity's source for condoms. Ida's mom grabs for the desk and then falls backwards. She's mostly ok.
And now I'm hitting the pause button. Will I read this book? I don't know! It is definitely unusual, but right now, it doesn't feel unusual in a good way. If the local library gets it, then perhaps I will. If so, I'll be back.